220 VOLT JUICER NOT FOR USE IN THE US. Start Your Day with a Fresh Glass of Fruit Juice! Are you worried about your growing kids and their dislike towards veggies? Don't worry! 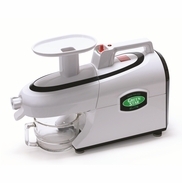 Bring home the Green Star Gold Juicer GPE1503 and extract out fresh and healthy fruit juice for them. You can also many times at short intervals give a treat of home-made bread sticks and pasta. The Green Power Gold Juicer is a versatile juicer that features an individual breadstick making and a pasta making kit. 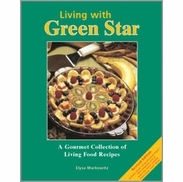 Powerful Green Star Gold Juicer with Heavy Duty Twin Gears! Green Power Gold Juicer is a must have for your kitchen. You can crush and blend your favorite vegetables to give a head start to your daily routine. 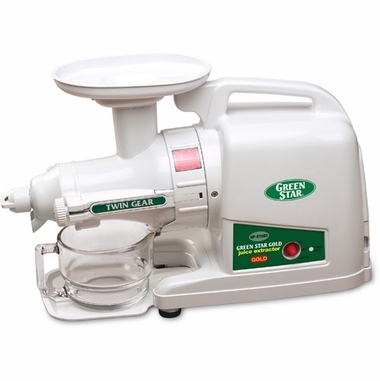 This power packed, Green Star Gold Juicer has top-class heavy duty twin gears which strongly crushes the fruits and keeps the nutritive content intact in the juices. It makes easier for your body to absorb all the hidden vitamins and minerals of the fibrous vegetable and fruits. This compact and space saving food processor and juicer can all alone replace multiple machines in your kitchenette. With this multi-purpose food processor you can unleash a hidden cook in yourself. You can prepare sumptuous and consistent almonds and dates paste for the pies, peanut and vegetable paste for sauces, baby food, frozen or jelly desserts and much more. You can bring imagination come true with this food processor.